P/O Donald Irwin Gage, RCAF 19996 – Air Bomber. Killed age 24 on the 12th of May 1944. Sgt. John William Gale, RAFVR 1271102 – Flight Engineer. Killed age 23 on the 31st of July 1943. Son of George William and Ellen Gale, of Hove, Sussex. Grave location – 2. F. 9. Sgt. Alfred John Thomas, RAFVR 1394123/ 149999 – Pilot. Sgt. Hector Alisdair ‘Paddy’ Stewart , RAFVR 1029882 – Navigator. F/S Frederick William Raukawa Cumpsty, RNZAF NZ413386 – Air Bomber. Sgt. R.H. Boxell, RAFVR 1331932 – Wireless Operator. Sgt. John Hubert O’Farrell, RAFVR 1796043 – Mid Upper Gunner. Sgt. Ernest Frank Henry, RCAF R.139159 – Rear Gunner. BF458 was brought down to the north of Krefeld, near Bockum and Uerdingen. The sole survivors were the Navigator and the Wireless Operator who were captured as POW’s. The Flight Engineer and M/U gunner were buried in the Reichswald Forest Cemetery. The other three are commemorated on the Runnymede Memorial. F/O Norman Hathway Gale, RAFVR 151013 – Air Bomber. Killed age 30 on the 8th of September 1943. Son of Thomas Redstone Gale and Millie Gale, of Bristol; Husband of Elizabeth Ellen Gale, of Bishopston. Bristol. Buried Bristol (Canford) Cemetery, Avon, England.. Grave location – Sec. J. Grave 278. F/O Ian Robert Menzies, RNZAF NZ415002 – Pilot. P/O Derek Albert Arthur Cordery, RAFVR 136360 – Navigator. P/O Norman Hathway Gale, RAFVR 849986/ 151013 – Air Bomber. Sgt. Ralph Herbert Barker, RNZAF NZ417189 – Wireless Operator. Sgt. Albert Leslie Mellor, RAFVR 943914 – Flight Engineer. Sgt. G. Bullivant, RAFVR 1395379 – Mid Upper Gunner. Sgt. Stewart Donald Muir, RNZAF NZ416967 – Rear Gunner. P/O Alan Russell Galletly, RNZAF NZ427481 – Pilot. Killed age 33 on the 5th of October 1944. Son of Charles David Galletly, and of Elizabeth Galletly (Nee Gray), of Hawarden, Canterbury, New Zealand. Grave location – 8. G. 8. Thirty one aircraft took off as detailed to attack the railway centre at Saarbrucken. They all reached the target area but only fourteen bombed before the Master Bomber issued instructions to abandon the mission. Bombing appeared scattered, and the raid was unsatisfactory. The aircraft captained by NZ 427481 F/Sgt Galletly, A. failed to return. F/S Alan Russell Galletly, RNZAF NZ427481 – Pilot. F/S Stuart Edwin Mosley, RNZAF NZ426106 – Navigator. Sgt. 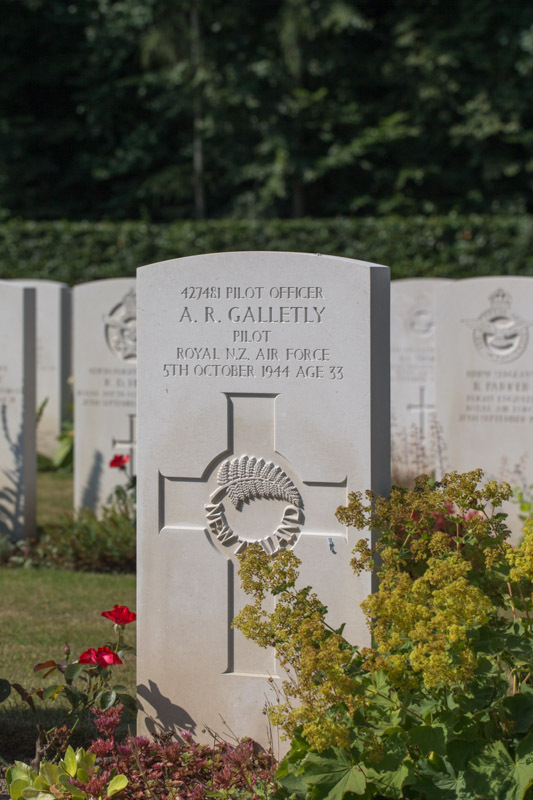 Roy Albert Wells, RAFVR 1802473 – Air Bomber. Sgt. Reginald Samuel Hond, RAFVR 1214443 – Wireless Operator . Sgt. Peter Eric Tuthill, – Flight Engineer. Sgt. Arthur Kitchener Sutton, RAFVR 1816276 – Mid Upper Gunner. Sgt. John Peter Cooke, RAFVR 1816385 – Rear Gunner. Sgt. Eric Francis Gannaway, RNZAF NZ402110 – Rear Gunner. Killed age 21 on the 12th of May 1941. Son of Cyril Francis and Miriam Elsie Gannaway, of Napier, Hawke’S Bay, New Zealand. Grave location – Row A. Grave 5. Eleven Wellington aircraft were detailed to carry out individual bombing attacks against the above target. One of these aircraft, Captained by S/L. Widdowson, was attacked by an unforeseen aircraft at 4000 feet near Cromer. The machine was badly damaged and the rear gunner, SGT Ganaway, was fatally wounded. Bombs were jettisoned in sea and aircraft returned to base. The remaining aircraft dropped all bombs and bursts were seen and fires started. Intense light and heavy A.A. fire was experienced in target areas and searchlights were active and working in cones. Several fighters were seen in target areas. The weather was good, but there was haze over target. Navigation was by D/R, astro, W/T. map reading. S/L Reuben Pears Widdowson, RAFVR 34256 – Pilot. Sgt. Anthony Saunders, RAFVR – 2nd Pilot. Sgt. Lawrence Alan Lawton, RNZAF NZ391883 – Observer. Sgt. Monty’ Partridge, RAFVR – Wireless Operator. Sgt. Wilfred Bearne, RAFVR 976174 – Front Gunner. S/L Widdowson’s aircraft was attacked by an unseen enemy fighter at a height of 4,000ft near Cromer, on the east coast of England. They were climbing out on track about 30mins after take-off. The Wellington was badly damaged in the attack and the rear gunner, Sgt Gannaway, was mortally wounded. The bomb load was jettisoned in the sea and Widdowson managed to maintain control of the aircraft and safely return to base, landing at 00:45hrs. Not long after landing, Sgt E F Gannaway, RNZAF, died as a result of his injuries. Sgt. Fred Garde, RAFVR 993802 – Wireless Operator. Killed age 21 on the 11th of October 1941. Son of Alfred Washington Garde and Jessie Garde; Husband of Doris Joan Garde, of Flixton, Lancashire. Grave location – Coll. grave 1. B. 5-8. Eight Wellington aircraft of this Unit were detailed to carry out the above attacks. One of these aircraft, Z8969, captained by Sgt Curlewis, failed to return to base. Another, X9825, captained by S/Ldr Chamberlain, jettisoned bombs on a road WSW of Cologne, as owing to damage to hydraulics, the aircraft was unable to maintain height with bombs on. Centre of town was successfully attacked and bombs were seen to burst. large fires were started and were seen to be burning twenty minutes later. One aircraft was seen to crash and explode in the city area. A.A. fire was intense at all heights from 12,000 feet, to 4,000 feet. Searchlights were active in two cones, one each side of target. Visibility was good, with large clearing in low cloud over the target area. Sgt. Raymond Fullerton Curlewis, RAAF AUS.402230 – Pilot. Sgt. Colin Maurice Thompson, RNZAF NZ4044237 – 2nd Pilot. Sgt. Alan Clifford Edwards, RAFVR 1163977 – Navigator. Sgt. Frederick Garde, RAFVR 993802 – Wireless Operator. Sgt. Robert Lea Warburton, RAFVR 978776 – Front Gunner. Sgt. Timothy Rowley Murphy, RNZAF NZ404037 – Rear Gunner. One aircraft was seen to crash and explode in the city area. It is possible that this may have been 75 Sqn’s Z.8969, which failed to return. Two other Wellingtons, from No 57 (Sister) squadron, Feltwell, also were shot down at or near Cologne. All these crew members perished. Their bodies were recovered and buried at the British WW 1 cemetery in the Zollstock district, South Cologne. At the end of the war, their remains were disinterred and taken to the Rheinberg.War Cemetery, eight miles south of Wessel. Sgt. Eric Garforth, RAFVR 2206796 – Wireless Operator. Killed age 21 on the 25th of August 1944. Son of Percy and Mary Garforth, of Dewsbury, Yorkshire. Sgt. William Henry Garvin, RAFVR 1077126 – Wireless Operator. Lost without trace age 20 on the 25th of July 1943. Son of Ernest and Lillian Garvin, of Orford, Warrington, Lancashire. Grave location – Panel 289. Twenty-three aircraft were detailed to attack the above targets with bombs of 2,000lbs., 1,000lbs., and incendiaries of 30lbs., and 4lbs. Of these aircraft, two returned early due to unserviceable W/T and engine trouble respectively, and one aircraft failed to return. The remainder successfully dropped their bombs in the target area. It was a very concentrated and successful attack. Very large spread fires were seen with black smoke rising to height of 1,400ft., some heavy explosions were also seen. A heavy A.A. barrage co-operating with searchlights were encountered and two aircraft were coned in the searchlights but neither were hit. The aircraft captained by F/O. G. TURNER whilst avoiding a searchlight cone, the starboard wing was struck by a JU 88approaching head on. The enemy aircraft turned over and dived to the ground, it was claimed to be destroyed.. The Stirling was badly damaged having more that 4ft. of the starboard mainplane torn off, and the aileron and aileron controls being useless. The captain had extreme difficulty in controlling the aircraft, but kept it on an even keel with the assistance of the Air-bomber, and after the 3 hours return flight to base, made a perfect landing. Two other short combats took place, but no damage was sustained to our aircraft. The weather was very good, with clear visibility, except for haze caused by smoke from the fires. Navigation was very good. The missing aircraft was Stirling Mk.III EE890 captained by Sergeant H. Nichol. Sgt. Henry Nichol, RAF 657425 – Pilot. F/S Alan James Robinson, RNZAF NZ42308 – Navigator. P/O Edgar John Mansell, RAFVR 1339755/ 132097 – Air Bomber. Sgt. Charles Edward Radford, RAFVR 1437419 – Flight Engineer. Sgt. Harold Sidney Norrington, RAFVR 646162 – Mid Upper Gunner. F/S Bernard Laurence Cooksley, RNZAF NZ41435 – Rear Gunner. Stirling Mk.III EE890 AA-L was shot down by a night-fighter (Fw Meissner, II /NJG3), crashing at Neumunster. The Captain, Flight Engineer, W/operator and Mid Upper gunner died. 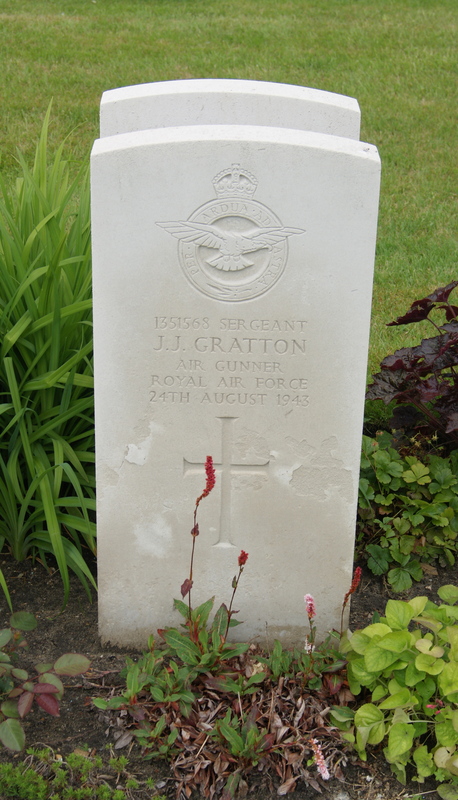 Sgt Norrington was buried in Hamburg Cemetery, Ohlsdorf. The Navigator, Air Bomber and Rear Gunner probably parachuted to safety as they were captured as POW’s. Sgt. Leonard Charles Gaskins, RAFVR 1392686 – Mid Upper Gunner. Lost without trace age 21 on th e4th of November 1943. Son of Charles Fredric John Gaskins, and of Mabel Gaskins, of Hilborough, Norfolk. Grave location – Panel 150. P/O Jack Ralph Gavegan, RNZAF NZ402128 – Rear Gunner. Lost without trace age 30 on the 9th of July 1942. Grave location – Panel 116. Thirteen a/c were detailed to attack the above target. Bomb load of 4000lbs, 1000lbs, and 4lb inc was dropped in the target area and hit were believed to be scored. There was heavy predicted flak and searchlights were scattered. No enemy a/c were seen. Weather was good clear over target. Navigation was excellent. P/O Trevor Harry Smith, RNZAF NZ41953 – Pilot. P/O Donald Norman Potts RNZAF NZ412267 2nd Pilot. P/O Alan Stuart Broun, RNZAF NZ405367 – Observer. Sgt. Frank Edwin McKenzie, RNZAF NZ391085 – Wireless Operator. Sgt. George Anthony Young, RNZAF NZ405771 – Front Gunner. Wellington Mk.III X.3557 AA-X came down at the northern end of the Waddenzee, near Rottumeroog Is at 01.30hrs. The time of the crash indicates the aircraft was still on the outward bound route to the target and was almost certainly shot down by one of the many German night fighters operating along that part of the Dutch coast. The details contained within German documentation regarding the injuries to the body of George Young certainly seem to support this, describing significant head injuires, assumed to be from a bullet or shell. All of the crew were killed. Only the bodies of Sgt Young and the Pilot, P/O Trevor Harry Smith were recovered. As mentioned previously, a second body was recovered with Sgt. Young’s – the conjecture by rank of the airman is that this was Frank McKenzie, however a positive I.D. was never able to be made. Trevor Smith was initially buried in Rottumeroog, but was subsequently moved to and re-interred at Oldebroek General Cemetery. The rest of the crew are remembered on the Air Force Memorial at Runnymede. Sgt. John William Germing, RAFVR 1803074 – Flight Engineer. Killed age 22 on the 28th of April 1944. Son of Wilhelmus Joseph and Leah Elizabeth Germing; Husband of Lilian May Germing, of Potters Bar, Middlesex. Grave location – Coll. grave 4. C. 1-7. Sixteen Lancasters were detailed to attack Friedrichshafen. Fourteen successfully carried out their mission, one aircraft bombed a decoy in error and another failed to return (Captain NZ42282 F/O. R. Herron). F/O Robert Weir Herron, RNZAF NZ425238 – Pilot. F/S Matthew Roland Henderson, RNZAF NZ427204 – Navigator. Sgt. Walter Reginald Percival, RAFVR 553063 – Air Bomber. F/O Euan Wilfred McLachlan, RAFVR NZ415266 – Wireless Operator . W/O Keith Alfred Smith, RNZAF NZ416022 – Mid Upper Gunner. P/O Peter Ernest Chilman, RAFVR 155992 – Rear Gunner. There was no report of Anti Aircraft fire or searchlights. It was apparent, however, that German night-fighters had arrived in numbers, as witnessed by other aircraft coming under attack. One such aircraft was ND796, the Lancaster of F/O Bob Herron and his crew. The remaining fifteen unit aircraft returned to base safely, landing between 03.50 – 06.20hrs. Lancaster Mk.III ND796 AA-J was shot down by a night-fighter just North West of the target, crashing 500 metres South East of Langenhart, about a mile North of Messkirch. There were no survivors. All seven crew were buried in a collective grave at Lagenhart. They were later reinterred at Durnbach War Cemetery. This aircraft was the first 75(NZ) Squadron Lancaster reported missing..
Sgt. Jack Gibbs, RAF 625697 – Wireless Operator. Lost without trace age 19 on the 24th of October 1940. Son of Philip Frederick and Maud Beatrice Gibbs, of Newbold, Warwickshire. Grave location – Panel 14. 23/10/1940 – Bombing Attacks on Berlin, Potsdam Station, D.148. Five Wellington aircraft were detailed to carry out the above attacks. One, CB.362, captained by P/O Sanderson, failed to return. A mixed bomb load was carried and consisted of 1000lbs. Bomb, delayed action, 500lbs. Bombs delayed action, 500lbs. Nombs fused N.D.T., 250lbs delayed action, 250lbs. bombs fused N.D.T., containers of incendiaries, while CB.359 carried one flash bomb. CB.358 reports results were not observed owing to two layers of cloud. CB.359 attacked flarepath probably east of Berlin, bursts unobserved, but incendiaries observed burning 300 yards short of flarepath. CB361 reports bombs seen to burst in vicinity of NEURUPPIN Aerodrome. No fires started. NO results were observed by CB.368 due to intensity of searchlights. EELDE Aerodrome lit with electric flare path and boundary lights. Red beacon at decoy aerodrome. Beacon flashing C.F. 530 3N 0450E. White beacon flashing 5 secs. approximately AMELAND. A.A. fire was heavy and accurate. Searchlights were few, and not very accurate owing to cloud. No enemy aircraft were seen. Heavy cloud was experienced in all areas. Navigation was by D/R, Astro and Q.D.M’s. P/O Rex Martyn Sanderson, RAF 42727 – Pilot. P/O William John Finlayson, RNZAF NZ39911 – 2nd Pilot. Sgt. White, RAF – Observer. Sgt. Jack Gibbs, RAFVR 625697 – Wireless Operator. Sgt. William Grice Hitchmough, RAFVR 653978 – Front Gunner. P/O Frederick Bernard Cleak, RAF 77961 – Rear Gunner . Wellington Mk.Ic P.9292 AA-C is known to have crashed into the North Sea off the Danish Coast. Returning from Berlin, it appears that the aircraft might have fallen prey to a number of German night-fighters that were known to be operating in this airspace. All of the crew, with the exception of P/O Frederick Cleak, were lost without trace and are remembered on the Runneymede Memorial. P/O Cleak, whose body was recovered was buried in Esbjerg (Fourfelt) Cemetery in Denmark. Sgt. 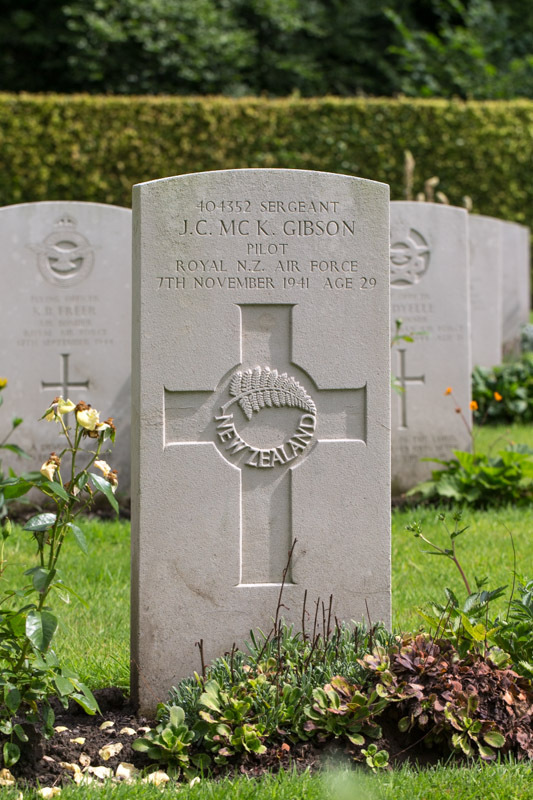 John Cuthbert McKechnie Gibson, RNZAF NZ404352 – 2nd Pilot. Killed age 29 on the 7th of November 1941. Son of John and Lillian Isobel Gibson, of Thames, Auckland, New Zealand; Husband of Ethel Frances Gibson, of Ngaio, Wellington, New Zealand. Grave location – 30. B. 5. Fourteen Wellington Ic aircraft were detailed from this Unit to attack the above targets. Two of these aircraft, X.9951, captained by F/O Methven and X.9976, captained by Sgt. Black, failed to return to base. A mixed bomb load was carried consisting of 1000lbs, 500lbs, 250lbs and containers of incendiaries. Bombs were dropped in target area and some large fires were started, but results were not clearly observed owing to heavy cloud over target area. A considerable amount of heavy flak was met over target area but searchlights, where seen, were ineffective. No enemy aircraft were met throughout the trip. Weather was poor with 10/10th cloud over target area. Navigation was good, Astro and D/R loops being used. Wellington Z.1091, captained by P/O Sandys returned to base owing to engine trouble. Wellington Z.1068, captained by Sgt. Parham returned to base owing to Navigator being sick. 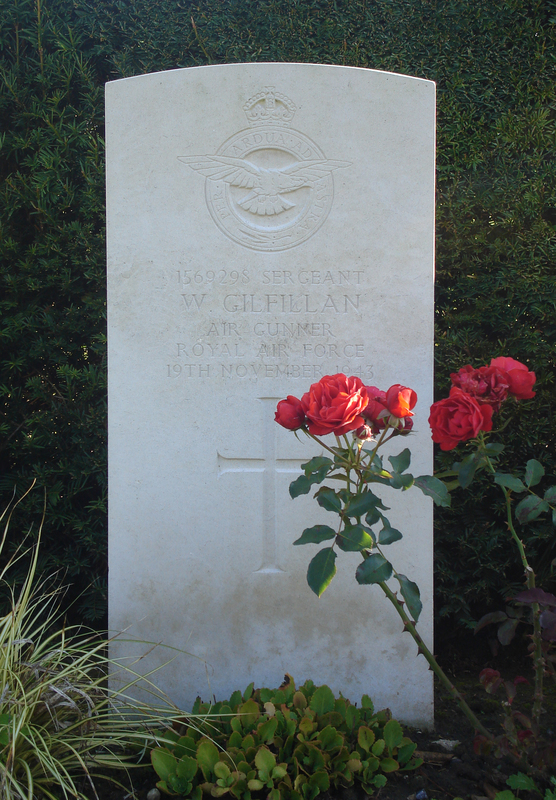 P/O William Reginald Methven, RAFVR 67072 – Pilot. P/O Donald Arthur Webster, RCAF J.5308 – Navigator. Sgt. A.B. Frisby, RAFVR 1255606 – Wireless Operator. Sgt. Thomas Patrick Duffy, RNZAF NZ40789 – Front Gunner. Sgt. R. Pattinson, RAFVR – Rear Gunner. F/S John Edward Gilbertson, RNZAF NZ41894 – Pilot. Son of Ernest E. H. and Laurie I. Gilbertson, of Waipawa, Hawke’S Bay, New Zealand. Buried Amsterdam New Eastern Cemetery, Holland. Grave location – Plot 69. Row E. Grave 17. Sgt. 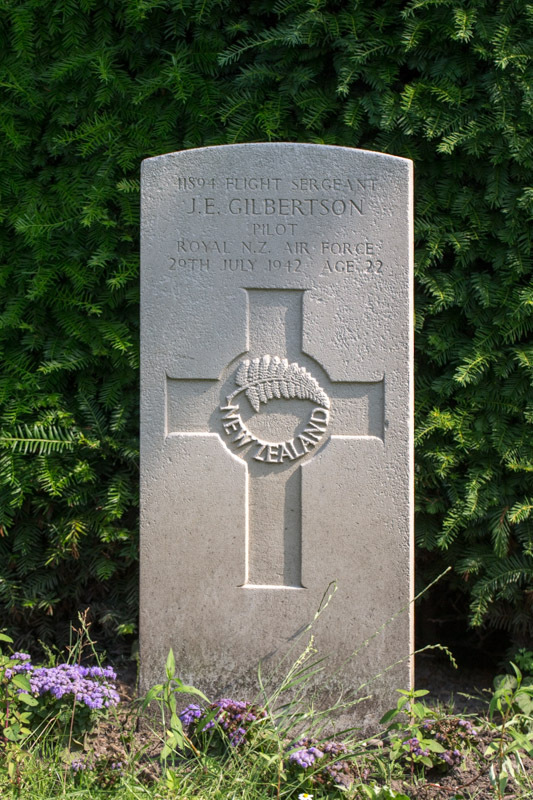 John Edward Gilbertson, RNZAF NZ41894 – Pilot. Sgt. Martin John Byrne, RNZAF NZ404529 – Observer. Sgt. Ronald Patrick Callaghan, RNZAF NZ411739 – Wireless Operator. Sgt. Alan Walter Rutherford, RNZAF NZ404572 – Front Gunner. Sgt. William Arthur Titcomb, RAFVR 1291758 – Rear Gunner. Wellington Mk.III BJ.661 AA-X was shot down by a German Ju 88 night-fighter at 03:05hrs into the Ijsselmeer, near Amsterdam, while on its way home following the Hamburg raid. The Ju 88 crew of two was Lieutenant Wilfgang Kuthe and his gunner, Unteroffizier Helmut Bonk. Only Callahan the W/op, and Rutherford the nose gunner, survived the crash and floated free, supported by their life vests. They were later rescued and sent to a POW camp. The bodies of the captain and navigator were recovered from the wreck and buried in Amsterdam. The rear gunner’s body floated free and was recovered later some distance from the crash site and buried at Harderwijk. P/O John Cecil Giles, RAFVR 138329 – Air Bomber. Killed age 19 on the 31st of August 1943. Son of George Albert and Irene May Giles, of Peckham Rye, London. Grave location – 16. C. 9. Eighteen aircraft were detailed to attack the above targets with bombs of 1,000lb., 500lb. and incendiaries of 30lb. and 4lb. Two aircraft failed to take-off and four did not return, the remainder successfully dropped their bombs in the target area. Large fires were seen, although rather scattered they appeared to be progressing very well. Moderate heavy A.A. fire co-operating with searchlights were encountered and one air craft received slight damage. Enemy night-fighters were in great prominence, the aircraft piloted by F/Sgt. Wilkinson, G encountered a JU88 approaching from astern 500yds away. The rear gunner fired a long burst, the enemy aircraft replied and stalled. The mid-upper gunner then fired three long bursts. The enemy aircraft was seen to fall away and is claimed as probably destroyed. Our aircraft received damage to the rear of the fuselage and had part of the tailplane and fin badly damaged. The aircraft captained by F/O Alexander sighted two Me109’s, the first opened fire from the starboard quarter and the rear gunner replied with a short burst. The enemy aircraft stalled and the mid-upper gunner fired a short burst. The enemy aircraft then dived to the ground and exploded, it was claimed to be destroyed. The second Me109 opened fire with a short burst from the port bow to the port quarter. The rear gunner then fired a short burst and tracer was seen to enter the enemy aircraft, which dived. It was claimed as possible destroyed. The aircraft captained by W/O Moseley, P. sighted a Me110 on the port quarter, the mid upper and rear gunner fired a long burst and the enemy aircraft turned over and dived with smoke pouring from its starboard side. It was claimed as probably destroyed. The aircraft captained by P/O C.Logan sighted a Me109 sixty yards astern, the mid-upper and rear gunner fired and tracer from the rear gunner was seen to hit the aircraft. The Stirling then corkscrewed and the Me109 disappeared. It was claimed to be damaged. Two other aircraft crash landed away from base due to damage caused by enemy fighters, none of the crews were injured however. 8/10ths cloud was encountered on the outward journey and 9’10ths at the target, visibility, nevertheless, was good. Navigation was very good. The missing aircraft were Stirlings MK.III EE918 captained by F/Sgt. Roberts,E, EE878 captained by F/Sgt. Henley, D, EE905 captained by F/Sgt. Helm,G. and EF501 captained by F/S McGregor, K.
F/S Eric John Roberts, RNZAF NZ417107 – Pilot. P/O Robert Gorman Rainford, RAFVR 134553 – Navigator. F/S Kensington Campbell Jackson, RNZAF NZ42330 – Wireless Operator. Sgt. Eric Saunders, RAFVR 1605321 – Flight Engineer. P/O Jack Henry Haydon, RAAF AUS.408400 – Mid Upper Gunner. F/S Darcy Leslie Conrad Haub, RNZAF NZ42326 – Rear Gunner. Stirling Mk.III EE918 AA-D was brought down over Germany, crashing at Derental, 5 miles South South East of Höxter. All except the mid upper gunner, P/O Haydon, RAAF, died and were buried at Hoxter, but later reinterred at Hanover. Jack Haydon, the only survivor, was captured as a P.o.W. F/S John Patrick Arthur Giles, RNZAF NZ425836 – WOAG. Killed age 21 on the 12th of September 1944. Son of George R. Giles and of Isabella Giles (Nee Bayne), of Christchurch, Canterbury, New Zealand. Grave location – Coll. grave 88. Eight aircraft were detailed to lay mines in the Baltic area, and they all dropped their mines as ordered. No opposition was met on the mining area, but fighters were thought to be active on the homeward route, and one aircraft had an inconclusive combat with a JU.88. Another aircraft (Captain NZ426041 F/O. W. Hadley) failed to return. F/O Wilson Orchard Hadley, RNZAF NZ426041 – Pilot. F/S John Bernard Gudgeon, RNZAF NZ428786 – Navigator. F/S David John Robert Wilcox, RNZAF NZ421244 – Air Bomber. F/S John Patrick Arthur Giles, RNZAF NZ425836 – Wireless Operator . Sgt. Colin R. Fowler, RAFVR – Flight Engineer. F/S William James Victo Boyd, RNZAF NZ428303 – Mid Upper Gunner. F/S John Matthew Biggar, RNZAF NZ427945 – Rear Gunner. Lancaster Mk.I LM268 AA-D was brought down at 00:15hrs by a night-fighter near the southern end of Sjælland Island, Denmark. The aircraft crashed onto a farmhouse near the township of Orslev, killing five members of the family. Only two of the crew, the Fight Engineer and Air Bomber, succeeded in baling out, the former evading capture and the latter, although badly hurt, was aided by locals and hospitalized before being turned over to the authorities. 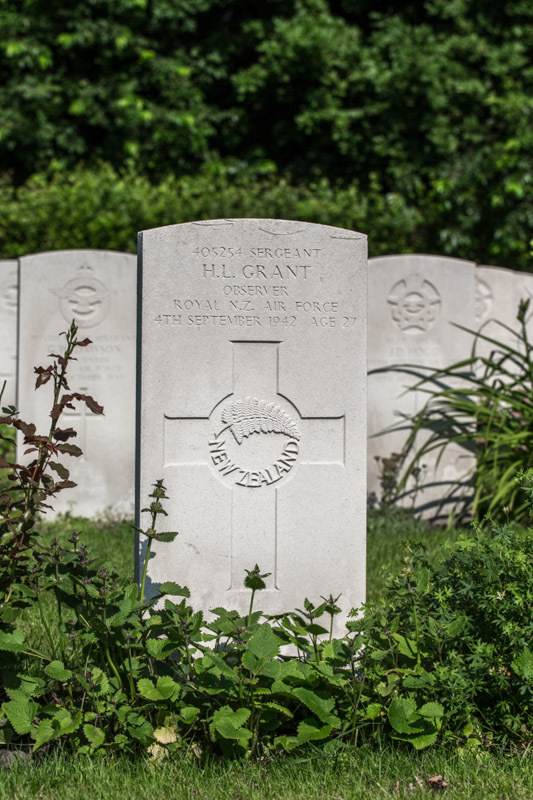 Of those in the crew who died, the Pilot and Rear Gunner were buried in the local Churchyard at Orslev while the other three were buried at the Svino Churchyard. Killed age 20 on the 19th of November 1943. Grave location – Grave 23. Sgt. John Trevor Vivian Gill, RNZAF NZ403362 – Rear Gunner. Killed age 27 on the 4th of September 1942. Buried Sage War Cemetery, Germany. Grave location – 3. A. 2. Sgt. James Law, RAFVR 1101018 – Pilot. Sgt. Horace Llewellyn Grant, RNZAF NZ405254 – Observer. Sgt. Rupert Ernest Renton, RNZAF NZ412352 – Wireless Operator. Sgt. Richard Alfred William Newman, RCAF NZ405309 – Front Gunner. Wellington Mk.III X.3396 AA-S was brought down near Wittmund, West North West of Wilhelmshaven and 55 miles from Emden. There were no survivors. All five crew are now buried at Sage, south of Oldenburg. Since neither X3396 nor X3794 reached their target at Emden, and both were brought down at similar locations in Northern Germany/Netherlands, it seems likely they were victims of enemy night fighter action. W/O Gottfred Lyall Gillan, RNZAF NZ42324 – Wireless Operator. Killed age 21 on the 21st of July 1944. Son of Douglas and Myrtle Lilyan Gillan; husband of Alice Ann Gillan (nee Graham), of South Grafton, New South Wales, Australia. Buried Tilburg (Gilzerbaan) General Cemetery, Holland. . Grave location – Plot B. Row 2. Grave 60. P/O Henry John Burtt, RNZAF NZ414560 – Pilot. F/S Vivian Connell, RAAF AUS.424158 – Navigator. W/O Herbert John Wellington Coedy, RCAF R.130143 J.96491 – Air Bomber. W/O Gottfred Lyall Gillan, RNZAF NZ42324 – Wireless Operator . Sgt. Vernon Charles Cornish, RAFVR 1609419 – Flight Engineer. Sgt. Walter Frederick Carter, RAFVR 1543208 – Mid Upper Gunner. Sgt. George Arthur Levy, RAFVR 1893404 – Rear Gunner. Killed age 24 on the 24th of June 1943. Son of Joseph and Clara Ann Gillard, of Great Bridge, Tipton, Staffordshire. Grave location – 4. C. 7. Sgt. Edward George Gilliatt, RAF 648452 – Navigator. Killed age 22 on the 16th of June 1944. Son of John and Ellen Orrell Gilliatt; husband of Monica Julia Gilliatt, of Cheetham Hill, Manchester. Buried Rieux Communal Cemetery, France..
Twenty four aircraft took off as detailed to attack the Marshalling Yards at Valenciennes. Twenty three aircraft attacked the primary target with the aid of markers. A.A. Fire was very slight, but fighters were active, two of our aircraft having combats with enemy aircraft. The aircraft captained by 175311 P/O. C. Crawford claimed hits on an enemy fighter, but sustained serious damage itself, the pilot, however, was able to land safely at Manstone. The aircraft captained by NZ421495 F/S. Betley, R. failed to return. F/S Roland Desmond Ernest Betley, RNZAF NZ421495 – Pilot. Sgt. Edward George Gilliat, RAFVR 648452 – Navigator. F/S Lawrence Eastmure Hale, RNZAF NZ42395 – Air Bomber. F/S Edward Wallace Toohey, RNZAF NZ416672 – Wireless Operator . Sgt. Basil Griffiths, RAFVR 1578754 – Flight Engineer. Sgt. Ronald Howe, RAFVR 993314 – Mid Upper Gunner. F/S Peter Jackson Cook, RNZAF NZ42708 – Rear Gunner. LL888 was brought down by a night-fighter SW of the target, crashing near Rieux, just NE of Cambrai. There were no survivors, six of the seven crew members were located in or near the wreckage and later buried at Rieux, The body of the seventh crew member was found some distance away indicating he probably had attempted to bale out, without success. Sgt. Daniel Gilmore, RAF 818024 – Wireless Operator. Killed age 25 on the 19th of March 1941. Buried Cardiff Western Cemetery, Glamorgan, Wales.. Grave location – Sec. J. Grave 649.
a/c crashed crew baled out gilmore killed chute didn’t deploy. Feltwell Station log records on 19th March at 03:30 (50?) – Crew of 75 A baled out in vicinity of Doncaster, Captain contacted. F/O John Kenneth Collins, RAFVR 40082 – Pilot. Sgt. Alexander Coutts Mee , RNZAF NZ40656 – 2nd Pilot. 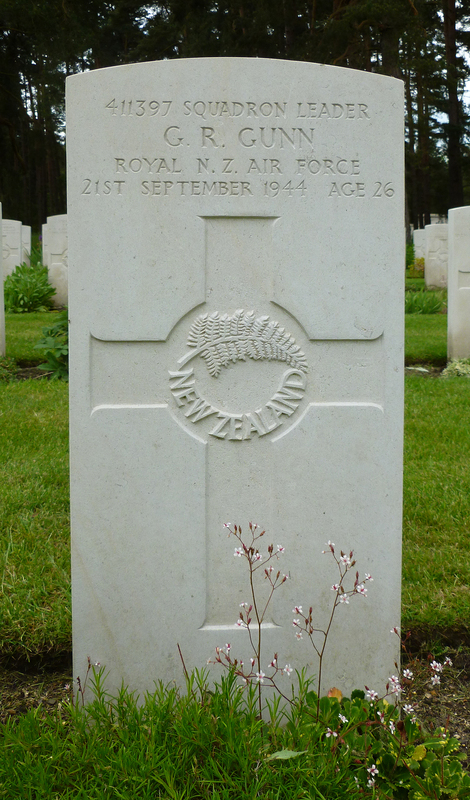 P/O Clarence William ‘Taffy’ Evans, RNZAF NZ40619 – Observer. Sgt. Daniel Gilmore, RAFVR 818024 – Wireless Operator. Sgt. Cole, RAFVR – Front Gunner. Sgt. John Tristram Peters, RNZAF NZ401230 – Rear Gunner. The crew of Wellington Mk.Ic T.2736 AA-A, had some difficulties establishing their position back in England and requested Hull to provide searchlight guidaance. This was not possible because of enemy aircraft activity in the area. As their aircraft was low on fuel, the Captain F/O Collins, RAF, had little option but to order his crew to bale out. The Wellington crashed near Ryhill, 14 miles South South East of Leeds, Yorkshire. All but one of the crew safely abandoned the aircraft. 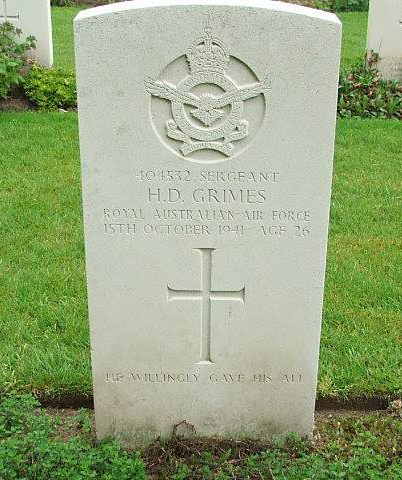 Sgt D Gilmore, the W/op Air/Gunner, was killed when his parachute failed to deploy. W/O Hugh Edward Gilmour, RAAF AUS.422667 – Pilot. Killed age 24 on the 21st of July 1944. Son of Hugh Edward and Otillio Mary Gilmour, of Southport, Queensland, Australia. Buried Eindhoven (Woensel) General Cemetery, Holland. .
W/O Hugh Edward Gilmour, RAAF AUS.22776 – Pilot. W/O Lindsay Arthur Woodward, RAAF AUS.417257 – Navigator. F/S Samuel Mills, RAAF AUS.425036 – Air Bomber. F/S John Edward Osborne, RAAF AUS.417877 – Wireless Operator . Sgt. Reginald Ernest Buzza, RAFVR 2203174 – Flight Engineer. Sgt. W.J.S. Ballard, RAFVR 1853215 – Mid Upper Gunner. Sgt. John Leonard Stephenson, RAFVR 2202048 – Rear Gunner. Lancaster Mk.III ND915 AA-A was brought down by an enemy night-fighter at 01:35hrs between Keldost (Noord-Brabant) and Erp, 3 miles South East of Veghel. Five of the seven crew died and two, the Navigator and Mid Upper Gunner, escaped uninjured to be taken as Prisoners of War. F/S Thomas Henry Gittins, RAFVR 1067871 – Wireless Operator. Lost without trace age 24 on the 7th of August 1943. Son of Arthur and Margaret Ann Gittins, of Hengoed, Glamorgan. Grave location – Panel 136. Killed age 31 on the 29th of April 1943. Grave location – Grave 20. Sgt. Arthur Ernest John Goddard, RAFVR 1323147 – Navigator. Lost without trace age 22 on the 21st of July 1944. Son of Mr. and Mrs. W. A. Goddard, of North End, Portsmouth. Grave location – Panel 230. Killed age 29 on the 12th of March 1942. Grave location – 2. H. 6. Sgt. 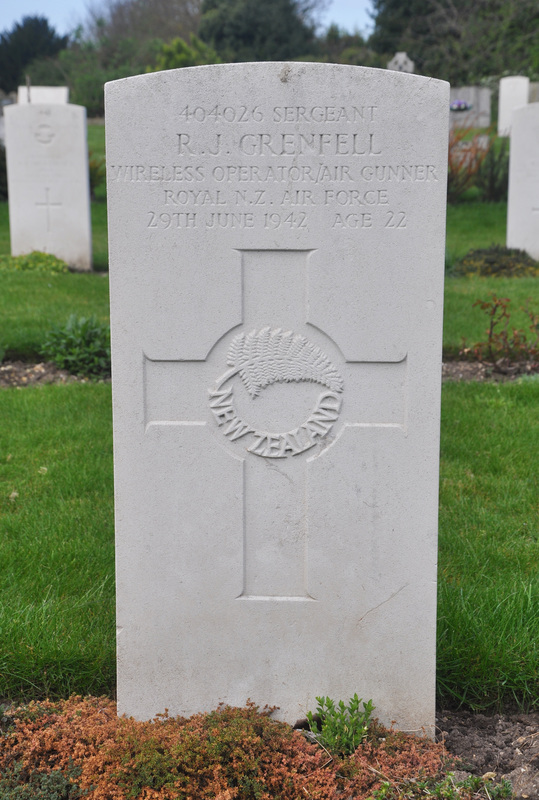 Stuart John Goff, RAFVR 916785 – Wireless Operator. Lost without trace age 20 on the 17th of December 1942. Son of John Thomas Goff and Norah Goff, of Dagenham, Essex. Grave location – Panel 84. W/C Victor Mitchell, RAF 37755 – Pilot. W/O Trevor Horace Bagnall , RNZAF NZ40640 – 2nd Pilot. F/S Reginald William Pearson, RAFVR 747858 – Navigator. Sgt. Gerald Thomas Padden, RAFVR 1041966 – Air Bomber. Sgt. Robert Hart, RAFVR 523663 – Flight Engineer. Sgt. Arthur Henry Rider, RAFVR 960489 – Mid Upper Gunner. F/S Albert Charles William Parker, RAFVR 909252 – Rear Gunner. Stirling Mk.I BF.396 AA-X was lost without trace and all crew presumed dead. They are commemorated on the Runnymede Memorial. The Captain, W/C V Mitchell, DFC, RAF, was the Squadron Commander. W/O Bagnall and his crew had only arrived on the Unit a few days previously. Sgt. Raymond Cyril Going, RNZAF NZ414278 – Pilot. Lost without trace age 21 on the 3rd of March 1943. Son of Cyril Milton Cutforth Going and Irene Margaret Going, of Maromaku, Bay of Islands, Auckland, New Zealand. Three aircraft were detailed to carry out the above operations, with mines of 1500 lb. Two of the aircraft successfully dropped their mines in the allotted area, the other aircraft failed to return. No A.A. fire or searchlights were encountered. Sergt. French the Captain of Stirling 1 BF398, met a JU88 on the homeward journey, after a short exchange of firing the enemy aircraft disappeared. The weather was very clear and visibility was good. Navigation was very good. The missing aircraft was Stirling 1 N6123, captained by Sgt. R.C.Going. Sgt. Arthur Mervyn Bridgman, RNZAF NZ41866 – Navigator. Sgt. Frederick Arthur William Willis, RAFVR 1382215 – Air Bomber. Sgt. Kenneth Cedric Eyre, RAFVR 1071970 – Wireless Operator. Sgt. Emrys Herbert Weaver, RAFVR 1409013 – Flight Engineer. Sgt. Francis Barkhouse Stewart, RAFVR 547841 – Mid Upper Gunner. Sgt. Clarence Sydney Burton, RNZAF NZ414493 – Rear Gunner. Took off from Newmarket to lay mines off the Frisian Islands. Lost without trace. All are commemorated on the Runnymede Memorial. The crew took off from Newmarket to lay mines off the Frisian Islands, off the coast of Denmark, part of the Squadron’s continuing efforts to disrupt German shipping. Mine-laying operations were often given to rookie crews as they were considered slightly less dangerous. Bomber Command code-named all the waterways after vegetables or fruit, hence these op’s became known as “gardening”. Sadly, on their very first operation, the Going crew was lost without trace. Lost without trace age 21 on the 3rd of September 1942. Son of Edward James Goldie and Ivy Alice Goldie, of Chichester, Sussex. Sgt. Henry Edward Goldsack, RAFVR 1250808 – Rear Gunner. Killed age 28 on the 13th of October 1942. Son of Edward and Martha Goldsack; Husband of Gertrude Alfreda Goldsack. Buried Kiel War Cemetery, Germany.. Grave location – 3. F. 6. Thirteen aircraft were detailed to attack the above target. Bomb load of 4,000 lb and incendiaries were dropped in the target area. Large fires were seen particularly on West side of Fiord. Light, medium and heavy A.A. fire was encountered over a large area, searchlights were also seen on the way to the target. No enemy aircraft were seen. The weather was clear, with no cloud over the target, visibility was good by the light of flares. Navigation was D.R, T.R. visual and pin-points. Wellington X3954 captained by Sergt. Watters failed to return. Wellington BJ837 captained by Sergt. Davey crashed at R.A.F. Station Lakenheath on return owing to shortage of petrol, four of the crew were injured. All taking part considered this to be a very successful raid. Sgt. Ventry Watters, RNZAF NZ413522 – Pilot. Sgt. Lewis Harry Parkinson, RNZAF NZ412518 – Observer. Sgt. Ellison George Firth, RNZAF NZ412218 – Wireless Operator. Sgt. Albert Cyril Orr, RAFVR 1145143 – Front Gunner. Wellington Mk.III X.3954 was disabled by AA fire in the target area at Kiel, then crashed 6 miles North West of Tonning, a town 50 miles due West of Kiel. All five crew were killed. They were initially buried at Brunsbüttelkoog Cemetery, but later reinterred at Kiel. 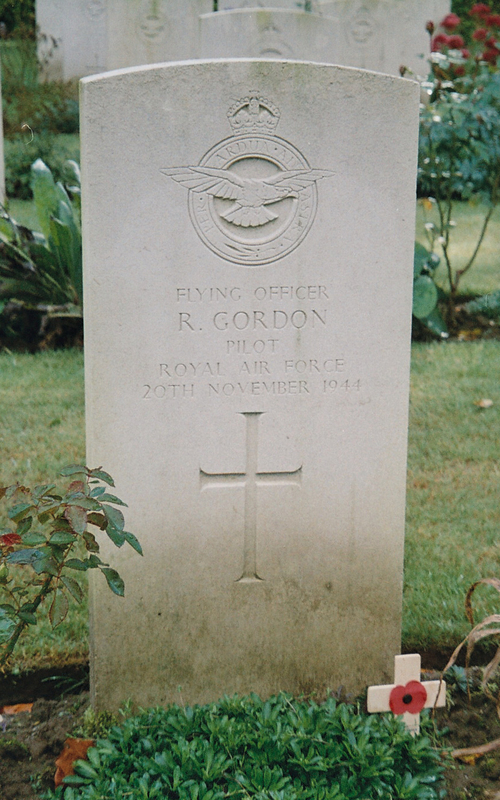 F/O Ronald Gordon, RAFVR 185116 – Pilot. Killed age 22 on the 20th of November 1944. Grave location – Coll. grave 29. B. 1-16. Twenty eight aircraft took off to attack the Oil Refinery Plant at Homberg. Twenty two aircraft in daylight attacked the target in ten tenths cloud with tops at 23,000 ft. which made formation flying very difficult. They carried 4,000 lb and 500 lb bombs. Results of bombing could not be observed, but it is considered that the raid was unsatisfactory. One aircraft AA/J returned early owing to icing trouble and two aircraft bombed last resort targets at Duisburg and Hamborn. Three aircraft failed to return. These were captained by 185116 F/O R. Gordon, AUS419328 F/O P. McCartin and 152402 F/O H. Rees. F/O Ronald Gordon, RAFVR 1580245/ 185116 – Pilot. P/O John Robson Bell, RAFVR 173943 – Navigator. F/S Albert John ‘Mick’ Weston, RAFVR 1115103 – Air Bomber. F/O Louis David Sampson, RAFVR 186413 – Wireless Operator . Sgt. Carl Robert Freeman, RAFVR 189608 – Flight Engineer. Sgt. Sidney George Hone, RAFVR 2221190 – Mid Upper Gunner. Sgt. James Leonard Forrester, RAFVR 3010665 – Rear Gunner. F/S Ralph Ernest Gorman, RCAF 93025 – Rear Gunner. Lost without trace age 24 on the 10th of September 1942. Son of Ernest B. and Anna M. Gorman, of Williamsburg, Pennsylvania, U.S.A. Grave location – Panel 104. Sgt. Frank Burrill, RCAF R.97521 – Pilot. P/O Randolph Cruickshank Smart, RNZAF NZ411006 – Observer. Sgt. Michael Bertram St. Louis, RCAF R.69204 – Wireless Operator. Sgt. William Wilfred Henry Lavers, RAFVR R.83468 – Front Gunner. Sgt. Ralph Ernest Gorman, RCAF R.93025 – Rear Gunner. Wellington Mk.III BJ.968 AA-W was lost without trace. All five crew are commemorated on the Runnymede Memorial. Sgt. James Douglas Gould, RNZAF NZ411233 – Observer. Lost without trace age 21 on the 11th of July 1942. Son of Alfred and Mary Isobella Gould, of Otautau, Southland, New Zealand. Four a/c set out to attack the above target. Bomb load of 500lbs was bought back as m/c returned owing to lack of cloud cover. Well.III, X3720(Sgt. Wilmhurst) failed to return. There was no A.A. fire or fighters. Weather was cloudy and navigation was good. F/S John Charles Wilmshurst, RNZAF NZ411962 – Pilot. Sgt. Richard Edwin Sharp, RNZAF NZ405513 – Wireless Operator. Sgt. Peter Desmond Lowther, RNZAF NZ403583 – Front Gunner. Sgt. Raymond John Finlay ‘Browny’ Hirst, RNZAF NZ404067 – Rear Gunner. X3720, AA-U was the first of the four 75 (NZ) Sqdn aircraft detailed to carry out the attack to take off from Feltwell. They left at around 2.30 in the afternoon, followed by the Jarman, McLachlan and Kearns crews. The four were recalled on the way to the target, near the Dutch coast, due to lack of cloud cover over the target. All but X3720 were safely back on the ground at Feltwell by 5.37pm. The Wilmshurst Wellington came down into the sea off the German-Netherlands coast, well north of their expected route back to base. Three of the crew are commemorated on the Runnymede Memorial. The bodies of the wireless operator and front gunner washed ashore a few days later onto the German island of Borkum. They were buried there in the Lutheran Cemetery on the 15th, but later re-interred at Sage, 24km south of Oldenburg. F/S Kenneth Wilfred Gower, RNZAF NZ421272 – Mid Upper Gunner. Killed age 28 on the 28th of May 1944. Son of Algernon Carlyle Gower and Mary Bayly Gower, of Tututawa, Taranaki, New Zealand. Buried Wevelgem Communal Cemetery, Belgium..
Thirteen aircraft were detailed to attack Aachen and eleven to attack a target at Boulogne. They all were successful in attacking their respective targets and good concentrated bombing was reported. Two aircraft attacking Aachen had combats with enemy aircraft, NZ40750 F/L. R. Berney claiming the destruction of an enemy night fighter and 170664 P/O. T. Buckley claimed strikes on a F.W. 190. There was no opposition from the Boulogne target. F/L Spencer Francis Fauvel, RNZAF NZ414971 – Pilot. F/O Francis Henry Clark Lukey, RNZAF NZ42990 – 2nd Pilot. F/O Frederick William Clare, RAFVR 144607 – Navigator. F/S Maurice Isidore Joseph Fitzgerald, RAFVR 1389106/ 176576 – Air Bomber. F/S Douglas William James Marvin, RAFVR 176037 – Wireless Operator . Sgt. Kenneth Clinch, RAFVR 1288144 – Flight Engineer. F/S James Rooker Mason, RNZAF NZ421307 – Rear Gunner. Lancaster Mk.III ND908 AA-M was brought down at Poelkapelle (West-Vlaanderen) 5miles North East of Ypres and 25 miles West of Courtrai, scene of the FW .410 attacks on ND915 in the same raid. There were no survivors and all eight crew members were laid to rest at Wevelgem Communal Cemetery. Sgt. Andrew Graham, RAFVR 1369996 – Flight Engineer. Lost without trace age 21 on the 28th of April 1943. Grave location – Panel 151. Sgt. Alfred Edward Lewis, RAAF AUS.412458 – Pilot. Sgt. Henry George Corin, RNZAF NZ417269 – Navigator. P/O Charles John Bickman, RAFVR 49977 – Air Bomber. Sgt. Frederick Arthur Moulton, RAFVR 1292879 – Wireless Operator. Sgt. John Herbert Whitehart, RAFVR 964185 – Mid Upper Gunner. Sgt. Victor Charles Howes, RNZAF NZ413418 – Rear Gunner. Stirling Mk.I R9290 AA-Y was operating in the ‘Radish’ area of the Fehmar-Belt, in the Baltic, and was brought down in the sea off the Danish Island of Lolland, to the West of the Vesternaes. There were no survivors. The crew is commemorated on the Runnymede Memorial. Sgt. Eric Grainger, RAF 652045 – Flight Engineer. Lost without trace age 21 on the 23rd of June 1943. Son of William Henry and Myra Grainger. Fifteen aircraft were detailed to attack the above targets with incendiary bombs of 30lbs and 4lbs. Four aircraft failed to return and the remainder successfully dropped their bombs in the target area. Large concentrated fires and some explosions were seen the whole RUHR area was smoke palled. A very heavy A.A. barrage co-operating with searchlights was encountered and five aircraft were slightly hit by A.A.fire, some enemy aircraft were seen and three short combats took place, but no damage was sustained by our aircraft. There was 3/10ths cloud on the target area but visibility was fairly good, except for smoke haze. Navigation was very good. The missing aircraft were Stirling Mk.I EF399 captained by F/S Burbidge, Mk.III EF408 captained by Sgt. Wood, MK.III BK810 captained by W/O McKenzie and Mk.III EH889 captained by F/O McCrorie. F/O Thomas Fraser McCrorie, 1365093/ 68770 – Pilot. P/O William Stuckey, RAF 51042 – Navigator. F/S James Leonard Richards, RNZAF NZ404946 – Air Bomber. Sgt. Richard Douglas Tod, RCAF R.91741 – Wireless Operator. Sgt. Eric Grainger, RAFVR 625045 – Flight Engineer. Sgt. Robert Ernest Tod, RCAF R.91742 – Mid Upper Gunner. Sgt. Raymond Anthony Kennedy, RAFVR 1003148 – Rear Gunner. Stirling Mk.III EH889 AA-Z was shot down by a night-fighter (Oblt Lothar Linke, IV /NJG1) at 01:58hrs, crashing into the Ijsselmeer. All on board died, their bodies later washing ashore. F/L McCrorie was buried in Hemelumer-Oldeferd (Molkwerum) Protestant Churchyard. P/O Stuckey rests in Wonseradeel (Makkum) Churchyard. The Todd twins lie in Medemblik General Cemetery. Sgt Kennedy is buried at Wieringermeer (Middenmeer) General Cemetery. The others are commemorated on the Runnymede Memorial. 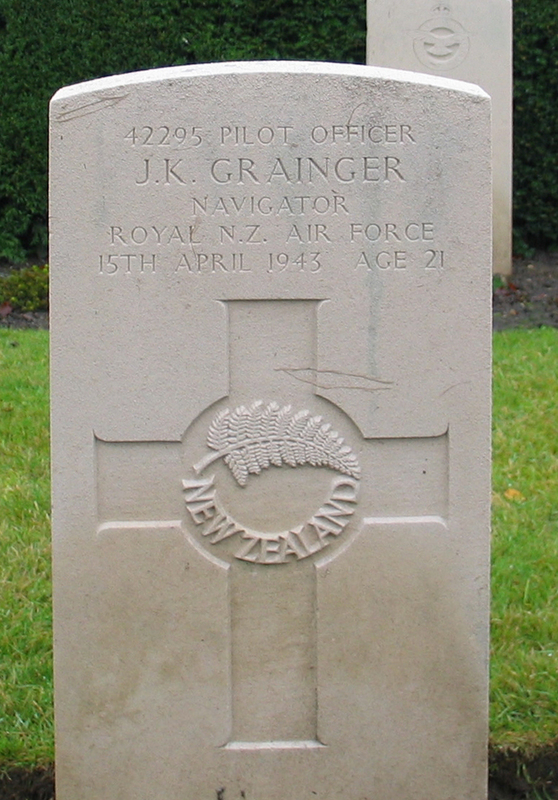 P/O James Kennedy Grainger, RNZAF NZ42295 – Navigator. Killed age 21 on the 15th of April 1943. Son of William Grainger and of Ida Grainger (Nee Main), of Napier, Hawke’S Bay, New Zealand. Buried Florennes Communal Cemetery, Belgium. Grave location – Plot 2. Coll. grave 22-26. Eleven aircraft were detailed to attack the above target with incendiary bombs of 30 lb and 4 lb. One aircraft returned early as the controls were faulty. None of the remaining aircraft successfully dropped their bombs in the target area. Large fires were seen, together with a great deal of black smoke. There was a moderate amount of heavy A.A. Fire encountered on the way to the target, but very little in the target area. A few searchlights were seen, but they were ineffective. Some enemy aircraft were seen and short combats took place, but our aircraft were not damaged. It was very clear over the target, as there was a bright moon, and visibility was good in spite of slight ground haze. Navigation was very good. Stirling Mark III BF513 captained by P/O. D.J. McCaskill failed to return. P/O Donald Gordon McCaskill, RNZAF NZ413573 – Pilot. Sgt. Bertram Elwell, RAFVR 519416 – Air Bomber. Sgt. 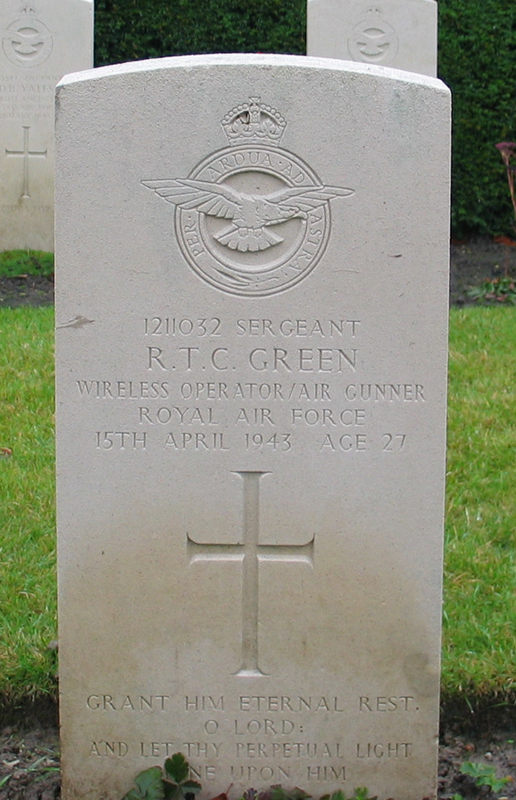 Reginald Thomas Charles Green, RAFVR 1211032 – Wireless Operator. Sgt. Angus McVicar, RAFVR 1371651 – Flight Engineer. Sgt. Ernest Desmond Cook, RAFVR 1609864 – Mid Upper Gunner. Sgt. Ronald Alexander Smith, RNZAF NZ415378 – Rear Gunner. BF513 was shot down by an enemy night-fighter (Lt Fritz Graef, I. /NJG4) over Belgium at 02.25hrs, crashing at Regniéssart, (Namur), 3 miles SE of Couvin. There were no survivors. All the crew are buried at Florennes’ Communal Cemetery. Sgt. Terence Grange, RAFVR 1323448 – Rear Gunner. Lost without trace age 22 on the 1st of September 1943. Son of John and Ellen Grange; Husband of Esther Grange, of South Lambeth, London. Eighteen aircraft were detailed to attack the above targets with bombs of 1,000lb., 500lb. and incendiaries of 30lb. and 4lb. Two aircraft failed to take-off and four did not return, the remainder successfully dropped their bombs in the target area. Large fires were seen, although rather scattered they appeared to be progressing very well. Moderate heavy A.A. fire co-operating with searchlights were encountered and one air craft received slight damage. Enemy night-fighters were in great prominence, the aircraft piloted by F/Sgt. Wilkinson, G encountered a JU88 approaching from astern 500yds away. The rear gunner fired a long burst, the enemy aircraft replied and stalled. The mid-upper gunner then fired three long bursts. The enemy aircraft was seen to fall away and is claimed as probably destroyed. Our aircraft received damage to the rear of the fuselage and had part of the tail plane and fin badly damaged. The aircraft captained by F/O Alexander sighted two Me109’s, the first opened fire from the starboard quarter and the rear gunner replied with a short burst. The enemy aircraft stalled and the mid-upper gunner fired a short burst. The enemy aircraft then dived to the ground and exploded, it was claimed to be destroyed. The second Me109 opened fire with a short burst from the port bow to the port quarter. The rear gunner then fired a short burst and tracer was seen to enter the enemy aircraft, which dived. It was claimed as possible destroyed. The aircraft captained by W/O Moseley, P. sighted a Me110 on the port quarter, the mid upper and rear gunner fired a long burst and the enemy aircraft turned over and dived with smoke pouring from its starboard side. It was claimed as probably destroyed. The aircraft captained by P/O C.Logan sighted a Me109 sixty yards astern, the mid-upper and rear gunner fired and tracer from the rear gunner was seen to hit the aircraft. The Stirling then corkscrewed and the Me109 disappeared. It was claimed to be damaged. Two other aircraft crash landed away from base due to damage caused by enemy fighters, none of the crews were injured however. 8/10ths cloud was encountered on the outward journey and 9’10ths at the target, visibility, nevertheless, was good. Navigation was very good. The missing aircraft were Stirlings MK.III EE918 captained by F/Sgt. Roberts,E, EE878 captained by F/Sgt. Henley, D, EE905 captained by F/Sgt. Helm,G. and EF501 captained by F/S McGregor, K.
F/S Keith Alexander McGregor, RNZAF NZ415770 – Pilot. F/O James Benjamin Lovelock, RNZAF NZ416324 – Navigator. F/S William Adam Kilby, RNZAF NZ415261 – Air Bomber. F/S James Guthrie Baker, RNZAF NZ41142 – Wireless Operator. Sgt. G.A.A. Bond, RAFVR 1801229 – Flight Engineer. Sgt. G.F. Dummett, RAFVR 1377778 – Mid Upper Gunner. Stirling Mk.III EF501 AA-K was shot down by a night-fighter SW of Berlin, crashing at Potsdam. All crew except the flight engineer and mid upper gunner were killed and are commemorated on the Runnymede Memorial. The two survivors, Sgt Bond and Sgt Dummett, were captured as POW’s. Sgt. Donald Cameron Kitchener Grant, RAF 527239 – Rear Gunner. Killed age 29 on the 23rd of May 1944. Son of Gregor James Grant and Catherine Grant, of Bearsden, Dunbartonshire. Son of Leonard and Constance Grant, of Christchurch, Canterbury, New Zealand. Grave location – 3. B. 4. Killed age 22 on the 24th of August 1943. Grave location – Coll. grave 6. E. 12-19. Stirling Mk.III BF564 JN-W was brought down at Martensmuhle, one mile South South West of Trebbin (13 miles South East of Potsdam). Sgt. Trevor Hedley Gray, RNZAF NZ404356 – 2nd Pilot. Killed age 27 on the 7th of November 1941. Son of Royden Arthur and Daisy Lennox Gray, of New Plymouth, Taranaki, New Zealand; Husband of Doreen Gray, of New Plymouth. Buried Bergen-Op-Zoom Canadian War Cemetery, Holland.. Grave location – 8. H. 2. Sgt. John William Black, RNZAF NZ402843 – Pilot. Sgt. 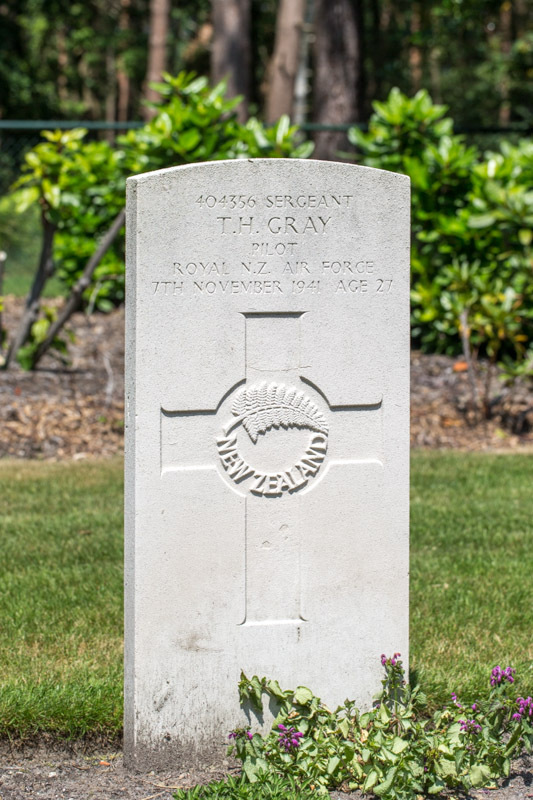 Trevor Hedley Gray, RNZAF NZ404356 – 2nd Pilot..
P/O Eric Lloyd, RNZAF NZ402197 – Navigator. Sgt. 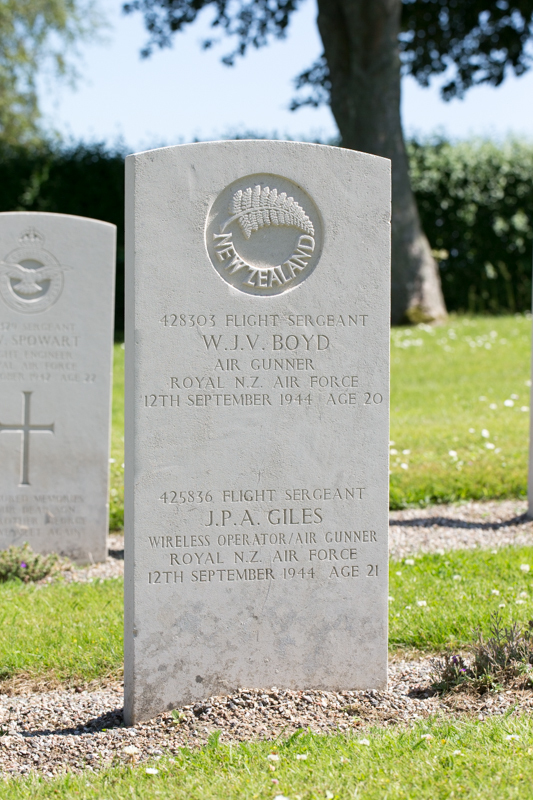 Leslie Cyril Green, RNZAF 755095 – Wireless Operator. Sgt. Jack Dennis Thompson, RAFVR 1152206 – Front Gunner. Sgt. Charles Thomas Black, RAFVR 1377719 – Rear Gunner. The other Wellington lost, X9976, was shot down by a German night fighter (pilot Ob Lt Helmut Lent, 4/NJG1) over the Netherlands, crashing at 01.20hrs at Oldeboorn (Friesland), 4 NM east of Akkrum, Holland. Sgt. Alfred Joseph Green, RAFVR 741824 – 2nd Pilot. Killed age 31 on the 20th of September 1940. Son of Mary and Thomas Green; Husband of Agnes Theresa Green, of New Costessey, Norwich. Father of Michael Francis Bernard Green and Phillppa Mary Green. F/S Cyril Vincent Green, RNZAF NZ402997 – Front Gunner. Lost without trace age 21 on the 11th of August 1942. Son of Cyril Vincent and Nora Green; Husband of Freda Mary Green, of Wimbledon, Surrey. Sgt. George Edward Francis Bradey, RNZAF NZ401954 – Pilot. F/O Thomas Henry William Baker, RAFVR 107286 – 2nd Pilot. S/L Ronald Ernest Kimber, RAF 45956 – Observer. Sgt. Arden Ivan Ellis, RCAF R.92690 – Wireless Operator. Sgt. Cyril Vincent Green, RNZAF NZ402997 – Front Gunner. Sgt. J. E. London, RAFVR 953137 – Rear Gunner. On the 12th of August 1942 Wellington Mk.III X3646 crashed into the North Sea. Piloting the aircraft that night was George Edward Francis Bradey, who had earlier been severely wounded in the abdomen by flak, whilst attacking the target of Mainz with 8 other aircraft from 75(NZ) Squadron RAF. The aircraft was struck by flak on the return flight, severely wounding the Captain in the abdomen. He was able to keep the aircraft on a westerly course till they were over the Dutch coast. A descent was made to 2,000ft and the crew was ordered to bale out but soon after, the aircraft ditched in the sea. The remaining details of the incident do not seem that clear. Of the crew of 6, 5 were killed. The only survivor being the Rear Gunner Sgt. J. E. London, who was captured and spent the remainder of the War as a Prisoner. Of the remaining 5 airmen who were killed, Pilot Officer George Bradey, Squadron Leader Ronald Ernest Kimber, the Navigator, Flight Sergeant Arden Ivan Ellis, Wireless Operator and Front Gunner, Flight Sergeant Cyril Vincent Green have no known resting place and are remembered on the Runnymede Memorial. Perhaps strangely in this case then, the body of 2nd Pilot Flying Officer Thomas Henry William Baker was recovered and now lays in Wilmslow Cemetery. F/S Leslie Cyril Green, RAFVR 755095 – Wireless Operator. Killed age 21 on the 7th of November 1941. Son of William and Rose Green, of Winchester, England. Grave location – Coll. grave 8. H. 3-7. The other Wellington lost, X9976, was shot down by a German night fighter (pilot Ob Lt Helmut Lent, 4/NJG1) over the Netherlands, crashing at 01.20hrs at Oldeboorn (Friesland), 4 nautical miles East of Akkrum, Holland. Killed age 27 on the 15th of April 1943. Son of Ernest and Miriam Amelia Green; Husband of Edna Daisy Green, of Medbourne, Leicestershire. Grave location – Row 2. Coll. grave 22-26. P/O Joseph Wesley Greening, RAAF AUS.40022 – 2nd Pilot. Lost without trace age 27 on the 3rd of July 1941. Grave location – Panel 62. Sgt. Ian Laurie Reid, RNZAF NZ391846 – Pilot. P/O Joseph Wesley Greening, RAAF AUS.400222 – 2nd Pilot. Sgt. John Ross Nation, RNZAF NZ40945 – Navigator. Sgt. Richard Edward Haycock, RAFVR 942288 – Wireless Operator. Sgt. Harold Jones, RAFVR 977479 – Front Gunner. Sgt. Roydon Horatio Hartstone, RNZAF NZ402111 – Rear Gunner. Wellington Mk Ic W5621, captained by Sgt Reid, failed to return to base and no communication or other evidence pointed to any possible reason for the crew’s disappearance. The aircraft was officially recorded as missing without trace. Killed age 22 on the 29th of June 1942. Son of William Henry Grenfell and of Nora Grenfell (Nee Sheehy), of Eltham, Taranaki, New Zealand. Grave location – Row C. Grave 5. Killed age 26 on the 15th of October 1941. Son of Alfred Ernest and Mary Ethel Grimes, of Taringa, Queensland, Australia. Grave location – Coll. grave 11. B. 1-4. Ten Wellington aircraft from this Unit were detailed to carry out the above attacks. A mixed bomb load was carried consisting of 1,000 lb, 500 lb, 250 lb GP’s and containers of incendiaries. Captains report that bombs were dropped on the target by estimation, but owing to slight haze over the target results were not seen. A considerable amount of heavy AA fire was experienced in and around the target area. Fire was accurate over Aachen. Searchlight activity was intense throughout the route but ineffective in the target area because of the cloud. Weather was fair en route but thick ground haze over all target area. Navigation was by Astro, D/R, QDM. Pinpointing and Lorenz check. Two of these aircraft, Z8945, captained by Sgt Barker, and X9916, captained by Sgt Matetich failed to return to base. P/O Trevor Bernard Robertson, RNZAF NZ404948 – 2nd Pilot. Sgt. David Levick Beney, RAFVR 960078 – Wireless Operator. Sgt. G.F. Cole, RAFVR 961126 – Front Gunner. Sgt. James Blake Stephenson, RCAF R.65625/ 96324 – Rear Gunner. The first of the two 75(NZ) Squadron Wellingtons lost this night was Wellington Mk.Ic W.5663 AA-O, which crashed to the North of Dusseldorf, possibly as a result of night fighter action – they were known to be operating in that area; accounting for the loss of 57 Squadron’s Wellington, shot down. The two Air Gunners, Cole and Stephenson, survived the impact and were taken Prisoners of War. The other four crew were all killed. They were buried in the Nord Friedhof. At the end of hostilities their remains were disinterred and taken to the Reichswald Forest War Cemetery. Killed age 20 on the 4th of November 1943. Son of Alfred S. S. and Emma Grimwood, of Dagenham, Essex. Grave location – Allied Plot. grave 49. Sgt. Richard Frederick Grove, RAFVR 1581242 – Mid Upper Gunner. Killed age 22 on the 31st of August 1943. Son of Frederick George and Eliza Ann Grove, of Machynlleth, Montgomeryshire. Grave location – 4. A. 12. F/S Victor Trevor Parkin, RNZAF NZ421090 – Pilot. F/S Terrence Watters, RNZAF NZ417299 – Navigator. Sgt. Ralph Valentine Clingan Johnson, RAFVR 1545885 – Air Bomber. Sgt. William Hadley Horrigan, RAFVR 1176649 – Wireless Operator. Sgt. Trevor Silcock, RAFVR 1582836 – Flight Engineer. Sgt. Anthony Francis Saunders, RAFVR 1394719 – Rear Gunner. Based on Val Johnson’s debrief with MI.9, it would appear that that EH938 possibly fell prey to a German night fighter, within a nachtjagd ‘box’. Val was the only survivor of the crew, the rest of the crew being killed when the aircraft crashed at Lommel (Limburg), in Belgium. The airmen were all buried in St-Truiden before being moved to Heverlee War Cemetery. F/S Alpheus Leslie Groves, RNZAF NZ403574 – Front Gunner. Killed age 30 on the 7th of September 1942. Son of Joseph and J. Groves, of Dunedin, Otago, New Zealand. Buried Tilburg (Gilzerbaan) General Cemetery, Holland. Grave location – Plot A. Row 1. Coll. grave 27-28. Fifteen aircraft were detailed to carry out the above attacks. Bomb load of 4,000lb. 1,00lb. 500lb. 250lb. and incendiaries were dropped in the target area, large fires were seen to be growing in intensity. A.A. fire was heavy and intense but was bursting high above aircraft, searchlights were intense, particularly at target area. Wellington BJ772 captained by F/Lt. Womersley was attacked from rear on return by an enemy aircraft, one bursts was fired by the rear gunner and the enemy aircraft was driven off. No other enemy aircraft was seen. The weather was good, clear over target with slight ground haze. Navigation was good. Wellington BJ.765 captained by Sergt. Sharman G.W> and Wellington X.3867 captained by F/Sgt.Parkes W.R. failed to return. F/S William Ronald Parkes, RNZAF NZ403822 – Pilot. Sgt. Henry Varley Gibb Crawford, RNZAF NZ404339 – Observer. Sgt. George Heerbert Rose, RNZAF NZ391713 – Wireless Operator. Sgt. Alpheus Leslie Groves, RNZAF NZ403574 – Front Gunner. Sgt. Eric Glover Wilson, RNZAF NZ404035 – Rear Gunner. Wellington Mk.III X.3867 AA-P was shot down by an enemy night-fighter (Hptm Walter Ehle, Stab II /NJG2), crashing at Riel (Nord Brabant), 5 miles South West of Tilburg, Holland. There were no survivors. All are buried in the Tilburg (Gilzerbaan) General Cemetery. 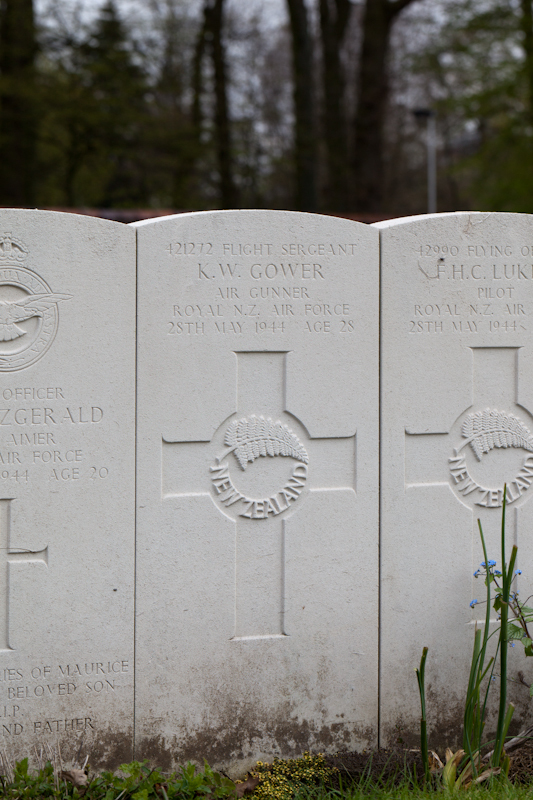 P/O Kelvin Havelock Green Groves, RNZAF NZ415819 – Pilot. Killed age 30 on the 17th of April 1943. Son of Thomas and Margaret Louise Groves; husband of Jessie E. Groves, of Masterton, Wellington, New Zealand. Buried Choloy War Cemetery, France.. Grave location – 2. A. 5. Sgt. Tom Graham Shergold, RAFVR 1149715 – Navigator. Sgt. Richard Fleury Wanstall, RAFVR 656462 – Air Bomber. Sgt. Rodney Leslie Pierson, RAFVR 1376120 – Wireless Operator. Sgt. Leslie Charles Cameron, RAFVR 971743 – Flight Engineer. Sgt. Ronald Charles Stone, RNZAF NZ413281 – Mid Upper Gunner. Sgt. Leslie Leonard Everden, RAFVR 1187983 – Rear Gunner. Stirling Mk.I BF451 AA-Z was considered to have been shot down by a night-fighter between Rilly-la- Montange and Chigny-les-Roses (Marne), 6 miles South of Rheims. None of the crew survived. They were laid to rest in Reims, then after the city became liberated by U S Forces in 1944, their bodies were taken to Antilly. After September 1944, their remains were exhumed and transferred to the Choloy War Cemetery, 145 miles south of Rheims. 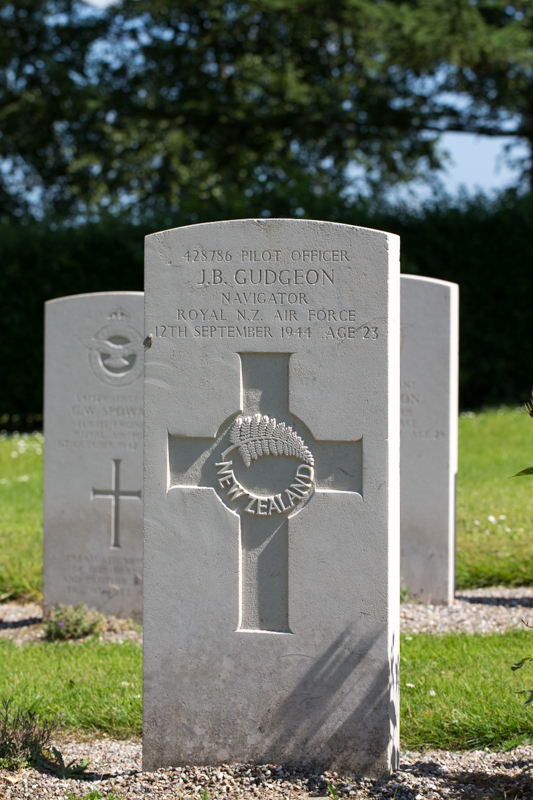 P/O John Bernard Gudgeon, RNZAF NZ428786 – Navigator. Killed age 23 on the 12th of September 1944. Son of John Edmund Gudgeon and of Mildred Gudgeon (Nee Trolove), of Christchurch, Canterbury, New Zealand. S/Ldr. Garth Reginald Gunn, RNZAF NZ411397 – Pilot. Died of injuries 3 days later, age 26 on the 21st of September 1944. Son of Reginald William and Olive Millicent Gunn, of Stokes Valley, Wellington, New Zealand. Buried Brookwood Military Cemetery, Surrey, England.. In the morning fourteen aircraft took off to attack Boulogne. Crews were able to identify landmarks and bombing was accurate, although much smoke hid results. The aircraft captained by NZ411397 A/S/L. G. Gunn was severely damaged by light flak, but he managed to fly back across the Channel even though both starboard engines were feathered. On landing at Hawkinge, however, the aircraft overshot the small runway and crashed. The Captain received injuries and was placed on the Dangerously Ill List, the Navigator 153453 F/O F. Smith was slightly injured, the Air Bomber NZ428249 F/O A Millar was placed on the Seriously Ill List, the Flight Engineer 1566967 Sgt Bruce, J was killed, but the remainder of the crew were uninjured, they were WO/AIR 47714 F/L W Naismith, MU/Gnr NZ411708 F/O C. Robertson and R/Gnr NZ402519 F/O S. Haynes. All of those injured were admitted to Kent and Canterbury Hospital, Canterbury and the body of Sgt Bruce was sent to his next of kin for burial. 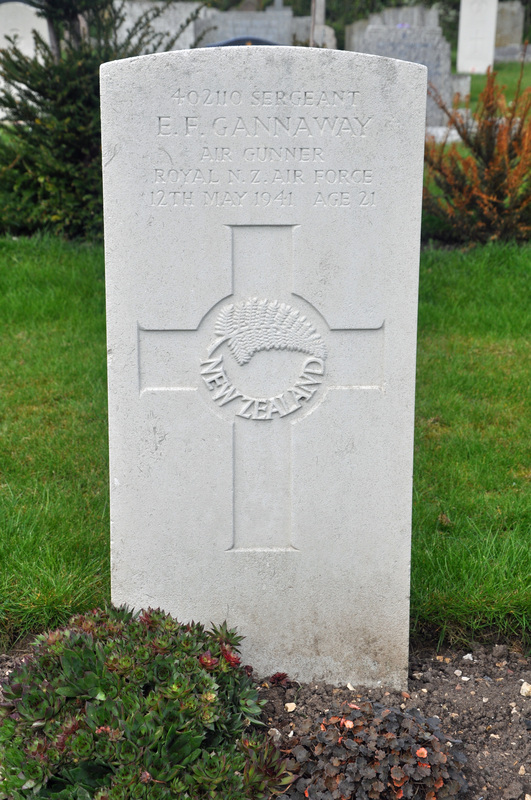 S/L Garth Reginald Gunn, RNZAF NZ411397 – Pilot. F/O Francis Robert Smith, RAFVR 1457442/ 153453 – Navigator. F/O Angus Moorcroft Millar, RNZAF NZ428249 – Air Bomber. F/L William French Morison Naismith, RAFVR 47714 – Wireless Operator . Sgt. John Henry Bruce, RAFVR 1566967 – Flight Engineer. F/O Charles Cameron Robertson, RNZAF NZ411708 – Mid Upper Gunner. F/O Stanley Raymond Haynes, RNZAF NZ401519 – Rear Gunner. Hit by flak(E) – 30mm shell S/L Gunn and crew, received a direct hit, which severely damaged the aircraft necessitating both starboard engines being shut down. The captain and flight engineer had difficulty in maintaining control of the aircraft returning across the Channel. A decision was made to carry out an emergency landing at RAF Hawkinge, an airfield with a short runway. The Lancaster overshot the runway and crashed. The Captain, Navigator and Air Bomber were injured, two seriously. The Flight Engineer was killed in the crash. The other three crew escaped uninjured.The pilot, S/L L G Gunn (‘B’ Flight Commander) died three days later from his injuries. Lost without trace age 26 on the 10th of September 1942. Son of Alfred and Elsey Mercy Guppy.